The Indian football team is scheduled to play against China in a friendly match at Suzhou Sports Complex near Shanghai on Saturday, October 13. The match will assist them in their preparation for the upcoming Asian Cup, which they have qualified after seven years. This is going to be the most exciting match between the two teams, who have faced each other 21 years ago, in the Nehru Cup at Kochi. China pipped India 2-1 in that game. The two nations clashed against each other 17 times, out of which China won 12, while five games ended in stalemate. So, India have never beaten China and this will be a great opportunity for the Men in Blue to break the record. India have won the Intercontinental Cup in June, beating Kenya 2-0 in the final, where captain Sunil Chhetri scored a brace. Earlier, India lost to Kyrgyzstan in the last group match of Asian Cup qualifier. But China will pose a different threat for Chhetri and Co. They are one of the strongest team in Asia. While China’s FIFA ranking is 76, India are placed at 97th. But again, ranking doesn’t always reflect the true story. 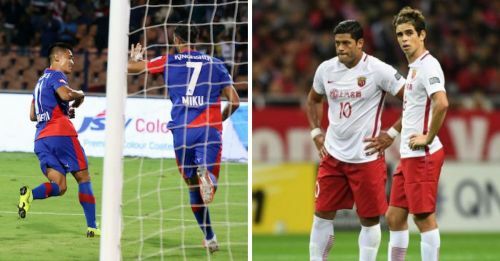 As the two teams are facing each other, comparisons seem to be imminent between their domestic leagues – Chinese Super League and the Indian Super League. In recent times, both the tournaments caught the world’s attention quickly. In fact, the ISL has followed the same path as of CSL. China have a long footballing history. Football matches started in the country from 1951 with the formation of Chinese Jia-A League. However, at the start of the century, Jia-A League was marred by match-fixing allegations, and subsequently, a new league was created. So, the CSL started its journey from 2004 and Jia-A League was demoted as a second division league. In India though, the case is almost the same. The first football league of India, the National Football League started in 1997 under the aegis of the All Indian Football Federation. The league was re-christened as I-League in 2007. However, for the growth and development of Indian football, a new league (ISL) was formed with a completely new set of teams. The league has caught the attention of the world and people started thronging at the stadiums in large numbers. Lack of branding and marketing put the I-League on the backbench. China coach Marcelo Lippi named 22 players in his squad against India. Out of them, 16 play in the CSL. On the contrary, everyone from Indian squad plies their trade in the ISL. Money and fame played a bigger role in both cases. Comparing the two leagues is difficult. CSL is far ahead on every department than ISL. After all, ISL has started only four years ago and still suffering the initial hiccups, which is common with every new tournament. Coaches are an integral part of every team. More often than not, clubs look for famous personalities for the job, who will bring success in a short time. So, the CSL is also not an exception. Currently, there are 11 among the 16 clubs have foreign coaches at their helm. Among them, a few are world famous. Like Fabio Cannavaro. A former World Cup winner with Italy, he is currently coaching Guangzhou Evergrande, the most successful team of the tournament. There is Bernard Schuster, coach of Dalian Yifang, who played for both the Madrid clubs and West Germany. Jordi Cruyff, the son of Johan Cruyff, also a famous coach in CSL, manages Chongqing Dangdai Lifan. ISL clubs also tried to run after famous coaches from the very beginning. There were a few good names like Brazilian legend Zico, Italy’s World Cup winner Marco Materazzi and Gianluca Zambrotta. Materazzi even led his team all the way to the title in 2015. However, Zico, who was the mainstay of Japan’s J-League revival, rued lack of infrastructure and referee’s before his departure. Sadly, no Indian has ever managed an ISL team, which is quite surprising for the developing nation in football. In the initial years, CSL’s reputation was marred by the controversy due to the on-going match-fixing saga. It resulted in a decline from the fans, who lost interest in club football. After 2011, things started to change. Clubs like Guanzhou Evergrande, Shanghai Shenhua and Shanghai SIPG started investing more. In 2016, Brazilian players Oscar and Ramires were signed by Chinese clubs. This created a flutter. Players from all over the world started showing interest any many of them even broke their contract and signed for Chinese clubs. Some of the famous players are Italians Graziano Pelle and Eder, Portuguese Jose Fonte, Ricardo Carvalho, Argentinian Ezequiel Lavezzi, Javier Mascherano, Nicolas Gaitan, Carlos Tevez, Brazilian Robinho, Renato Augusto, Gil, Alex Texeira, Hulk, Alexandre Pato, Talisca etc. So popular is CSL now that nine of its players participated in the Russia World Cup. Among them, Renato Augusto had scored a goal (against Belgium in the quarter-final). On the contrary, ISL is famous for bringing bygone players. In the very first year, World Cup winners Alessandro Del Piero and Marco Materazzi were signed by Delhi Dynamos and Chennaiyin FC respectively, but both of them failed to meet expectations. Materazzi though was successful as a coach for the Marina Machans next year. Roberto Carlos and David Trezeguet followed suit and failed to make their appearance count. It’s only this year that Tim Cahill, who played in the Russia World Cup and recently retired from national duty, was signed by Jamshedpur FC. To attract current players, ISL needs more money and marketing along with better infrastructure. They also need to go up in the FIFA rankings. Money perhaps is the only thing that matters. At least for the Chinese clubs. Immediately after gaining popularity, Chinese clubs started splurging more money. The government came in their support. Chinese President Xi Jinping, who himself is famous for his love for football, urged private and private sectors to invest more money on football. As a result, Guanzhou was purchased by one of the biggest commercial chain Alibaba, whereas Suning Commerce Group bought Jiangsu. Now, most of the clubs who play CSL are owned by big business companies and marketing chains. As of now, CSL’s market value is $422.39 million, while the player’s market value is €469.33 million. Each player gets an average salary of $1,016, 579 per year. Paulinho, who spent one year in Barcelona before returning to Guangzhou, is the costliest player in the CSL, with a value of €40 million. However, CSL earned criticism from various corner of the world, due to its over-spending of money. It was alleged that they are luring talented Brazilian players with a bagful of money. Brazil, in fact, restricted its players from going to China. Even managers across the world are ignoring players who are plying their trade in China. The rejection of Oscar and Lavezzi from their national teams is a proof of that. Concerned with the criticisms, the Chinese government also restricted the clubs from spending big amounts of money. Also, the number of foreign players were reduced to three, in order to give local players more chance. On the contrary, ISL franchises have a specific money cap. They can’t spend more than that, although some teams have challenged this decision. But considering the future of the country, the ISL authority told them to focus more on the youth development. Currently, ISL’s market value is €32.45 million, 11 times lower than that of CSL. China played only one World Cup in 2002. But their over-spending of money finally producing results. China held Asian superpowers South Korea in the East Asia Cup last year and won against Qatar. But they have a long way to go to match European and Latin American superpowers. For India, it’s all about playing with pride. ISL helped Indian football immensely and several youngsters emerged every year. So the process has to continue the same way before we can dream of a miracle.